From Bioworld Merchandising. 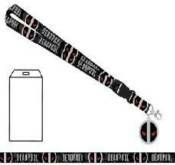 Get ready for summer convention season with these new Marvel Comics lanyards, perfect for holding your badge! Choose from Amazing Spider-Man, Captain America Comic Print, Captain America Suit Up, Deadpool X-Force, The Punisher, Spider-Man, Wolverine Logo, or X-Men Collage.